Reuben Foster understands the Iron Bowl rivalry. He has been, unofficially, on both sides of it. The universal five-star linebacker, and No. 2 player in the country according to Rivals and ESPN, verbally committed to Alabama last summer. 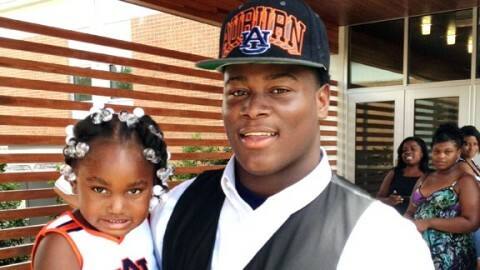 Today the 2013 prospect switched his commitment to Auburn via a written statement at a press conference in the cafeteria of Auburn High. The Iron Bowl flip immediately drew comparisons to T.J. Yeldon’s switch last December, when one of the nation’s top prospects in the 2012 class changed his commitment from Auburn to Alabama. Over the last few weeks, I’ve really put a lot of time and thought into where I want to go to school and continue my football career. I am blessed to be in a situation where I have several great opportunities and I appreciate everyone involved who has helped me get to this point. I want to make an announcement so I can put this behind me and get to work on the things I need to do to prepare for college both athletically and academically. I am going to enroll at the University of Alabama in January. I have a lot of respect for Auburn, the coaches, and all of the people there, but at the end of the day I feel like the University of Alabama is the best situation and fit for me and my family. I am 100 percent confident with my final decision. I feel great about it and I’m excited to get started. If you can’t hear it, just scroll up and read along with Yeldon’s statement. Because Foster’s announcement, save for the teams, was virtually identical. So much better than pulling a puppy from under the table. oh dang. That was intentional. Foster was trolling hard. I love it! That’s an in-your-face if there ever was one. That’s a slap in the face so hard, Kristen Saban herself would be proud to have delivered it.